Python is the recommended programming language for working with and automating tasks in ArcGIS; therefore, Python Scripting for ArcGIS will get experienced ArcGIS for Desktop users started quickly with Python scripting—no programming background required. 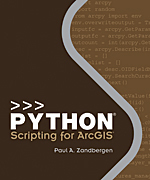 The book includes 14 chapters with corresponding exercises that cover Python and ArcGIS for Desktop geoprocessing fundamentals; how to write scripts that work with spatial data; specialized tasks, such as creating Python functions and classes; and how to create tools out of scripts and share them with others. A 180-day trial of ArcGIS 10.1 for Desktop Advanced is included. January 2013. ISBN: 978-1-58948-282-1, 368 pp., US$79.95. New edition, new exercises. Known for its broad scope, clarity, and reliability in introducing the principles of GIS, Getting to Know ArcGIS for Desktop is well suited for classroom use and independent study and as a reference. The third edition includes new topics, such as exploring online resources and raster data. 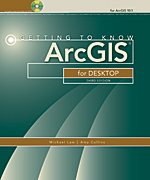 A data DVD for working through the exercises is included with the book, and access to a 180-day trial of ArcGIS 10.1 for Desktop Advanced is provided. February 2013. ISBN: 978-1-58948-308-8, 640 pp., US$84.95. Lining Up Data in ArcGIS: A Guide to Map Projections is an easy-to-navigate troubleshooting reference for any GIS user with the common problem of data misalignment. Complete with full-color maps and diagrams, this book presents practical techniques on how to identify data projections, create custom projections to align data, and solve common data alignment problems. The second edition is compatible with ArcGIS 10.1 and includes new sections on aligning CAD data and appropriate use of the web Mercator projection. February 2013. ISBN: 978-1-58948-343-9, 200 pp., US$24.95. GIS Tutorial 2: Spatial Analysis Workbook, 10.1 Edition, provides hands-on exercises to help GIS users at the intermediate level build problem-solving and analysis skills. The book offers experience with various spatial analysis methods, including location analysis; change over time, location, and value comparisons; geographic distribution; pattern analysis; and cluster identification. A 180-day trial of ArcGIS 10.1 for Desktop Advanced software and a DVD with data for working through the exercises are provided. Additional resources are available for instructors. January 2013. ISBN: 978-1-58948-337-8, 342 pp., US$79.95. For more information or to order Esri Press books, visit esri.com/esripress. Lining Up Data in ArcGIS: A Guide to Map Projections, Second Edition By Margaret M. Maher Lining Up Data in ArcGIS: A Guide to Map Projections is an easy-to-navigate troubleshooting reference for any GIS user with the common problem of data misalignment. Complete with full-color maps and diagrams, this book presents practical techniques on how to identify data projections, create custom projections to align data, and solve common data alignment problems. The second edition is compatible with ArcGIS 10.1 and includes new sections on aligning CAD data and appropriate use of the web Mercator projection. February 2013. ISBN: 978-1-58948-343-9, 200 pp., US$24.95. 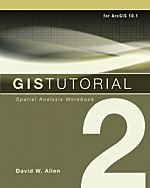 GIS Tutorial 2: Spatial Analysis Workbook, 10.1 Edition By David W. Allen GIS Tutorial 2: Spatial Analysis Workbook, 10.1 Edition, provides hands-on exercises to help GIS users at the intermediate level build problem-solving and analysis skills. The book offers experience with various spatial analysis methods, including location analysis; change over time, location, and value comparisons; geographic distribution; pattern analysis; and cluster identification. A 180-day trial of ArcGIS 10.1 for Desktop Advanced software and a DVD with data for working through the exercises are provided. Additional resources are available for instructors. January 2013. ISBN: 978-1-58948-337-8, 342 pp., US$79.95. For more information or to order Esri Press books, visit esri.com/esripress. GIS Tutorial 2: Spatial Analysis Workbook, 10.1 Edition By David W. Allen GIS Tutorial 2: Spatial Analysis Workbook, 10.1 Edition, provides hands-on exercises to help GIS users at the intermediate level build problem-solving and analysis skills. The book offers experience with various spatial analysis methods, including location analysis; change over time, location, and value comparisons; geographic distribution; pattern analysis; and cluster identification. A 180-day trial of ArcGIS 10.1 for Desktop Advanced software and a DVD with data for working through the exercises are provided. Additional resources are available for instructors. January 2013. ISBN: 978-1-58948-337-8, 342 pp., US$79.95. For more information or to order Esri Press books, visit esri.com/esripress. 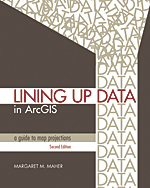 Lining Up Data in ArcGIS: A Guide to Map Projections, Second Edition By Margaret M. Maher Lining Up Data in ArcGIS: A Guide to Map Projections is an easy-to-navigate troubleshooting reference for any GIS user with the common problem of data misalignment. Complete with full-color maps and diagrams, this book presents practical techniques on how to identify data projections, create custom projections to align data, and solve common data alignment problems. The second edition is compatible with ArcGIS 10.1 and includes new sections on aligning CAD data and appropriate use of the web Mercator projection. February 2013. ISBN: 978-1-58948-343-9, 200 pp., US$24.95. Lining Up Data in ArcGIS: A Guide to Map Projections, Second Edition By Margaret M. Maher Lining Up Data in ArcGIS: A Guide to Map Projections is an easy-to-navigate troubleshooting reference for any GIS user with the common problem of data misalignment. Complete with full-color maps and diagrams, this book presents practical techniques on how to identify data projections, create custom projections to align data, and solve common data alignment problems. The second edition is compatible with ArcGIS 10.1 and includes new sections on aligning CAD data and appropriate use of the web Mercator projection. February 2013. ISBN: 978-1-58948-343-9, 200 pp., US$24.95.